So, I'm hoping to start on this pretty soon. Going to go look at fabrics tomorrow. Found a nice set of directions so I have a general idea of what I'm doing. Only thing I can't figure out is how to do the embroidery on it after I've assembled the pieces. We'll see when I get there. Just figured I'd say something in case anybody was interested. You could lay it out and do the embroidery before putting it together, or, put the outer part together, embroider that, then assemble the lining and padding and stitch it all together. I had originally thought to lay it out and do it beforehand. A friend of mine mentioned that it may not go together properly or look weird if I do it that way, though. We'll see. I want to go find materials today, first. It would be a lot easier to do the embroidery first as long as you are very precise about the seam line. If you try and embroider afterwards you may end up puckering the fabric as it will be quite hard to keep an even tension on it. Even if the 'embroidery' is actually braid I'd be tempted to do it first. I'd also put it in a frame to help with the tension; an old picture frame would do if you haven't got a square embroidery/quilting frame. It's just to make sure the weave of the fabric stays even while you are sewing. A word of warning though, I really wouldn't use a round embroidery hoop for fine silk or velvet, you will never get the mark of the frame edge out. It is much easier to embroider on the flat than on a made up garment/hat. Measurement is the key to getting a pattern to fit and not sew together with a gap or part of the design swallowed by a seam. However, a relatively plain smoking cap with a tassel and a simple cord or braid trim can look very spiffy too. So, I've looked at fabric options at Michael's, Wal-mart, and Kmart and have not found anything that I like yet. Going to go look at Hancock Fabric's in a few days. This is probably the hardest part so far. Just finding the perfect fabric is a challenge. There was a competition a couple of years back on Brass Goggles where people made hats. Some of these were men's smoking caps. If you can find these you may get some more ideas. Have a look around the local charity shops. A cap should not need too much material so you may find a jacket, dress, skirt or even curtains that could donate material. Charity shops would be my choice for fabrics, as well, my dear Miranda. A child's dress and a garish scarf provided material for the smoking caps I made as Yuletide presents for two friends of mine. Also cushion covers. And some of the fancy satin pillow cases and duvet covers come with a band of embroidery - and leave you with enough fabric to make something else. In fact a duvet cover would leave you with plenty to make a matching waistcoat too. We were at friends yesterday evening and I was seriously considering smuggling her curtains home with me to 'adapt' (beautiful wine red brocade with embroidered leaves), but they are also steampunkers and she obviously recognised the look on my face ... she did tell me where she'd got them from though - a local furnishing company's factory shop. Perhaps you have the same sort of thing local to you? At last, after months of searching, I have instructions, most of the materials and tools, time, and energy to begin the project! One big pile of materials and tools to make the cap. Going to make more than one and then pass on the other hats. 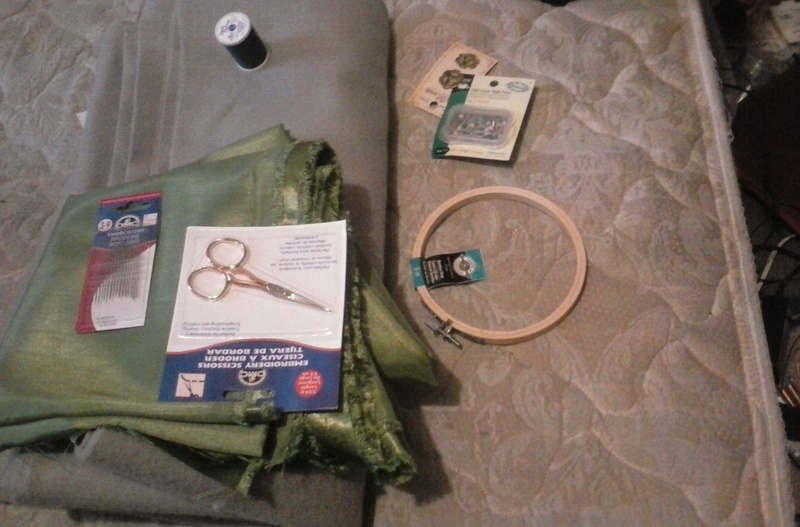 I still need to get yarn, embroidery floss, chalk, and a couple of other things before I get started. Yesterday I found the bits and pieces of my project, and the original. Looks like a good winter project by the wood fire! Im not entirely sold on the grey felt, personally, but it was the best I could find. Ill see how it works and then maybe try finding a different color if I end up not liking it. Love the colour of that silk. 1. Using that embroidery hoop - Wrap both parts of your embroidery frame before you use it; I always put bias binding round mine but even tissue paper is better than nothing. Without this it is very difficult to get the fabric to remain taut and if the fabric is not taut the embroidery stitches will not be the correct tension and will either pucker the fabric or be too loose on its surface. Don't leave the fabric in the hoop when you are not actually embroidering or you will find that you have a near permanent ring in the fabric which can only be removed by extreme ironing, which will in turn crush your embroidery. 2. Embroidery floss/silk - If you choose the traditional 6 stranded embroidery thread, don't try and use all 6 strands together as it can make stitches look very lumpy and is a *!$%*! to sew, instead split the 6 strands into 3 or even 2 and you will find it covers much more smoothly and evenly - and just as quickly, counter-intuitive as this may seem to be. It's also easier to thread in your needle (if you can thread 6 strands easily you are not using a needle, you are using a crowbar which will leave larger holes in your fabric). I can't see from the picture if you have bought dedicated embroidery needles, they have longer eyes than dressmaking ones and are what you need to have as they don't pull the thread into kinks while you are sewing. Only have about 12 inches of thread in your needle as it is less likely to knot or wear through. Yes I know that all seems a lot but it makes the actual embroidery go so much better and you can concentrate on the actual stitches if you've got the prep right. That's what my tutor at the London College of Fashion told me and I've passed the information on to any pupils I've had - which is not you exactly I know, but I do so want your project to go well and for you to enjoy it. If you want to know more just ask. Hope you don't mind me sticking my oar in. How generous of you to share those sewing tips with the group, Cora Courcelle. Really adequate prep work makes sewing much more enjoyable! Wow, thank you so much for the pointers Cora! Im still fairly new to the whole embroidery thing. As far as the green material goes, the lady at the fabric store pointed me to that and said it was brocade, if that means anything. It definitely doesn't feel like silk. Will that be any different? I also have a suggestion for anyone looking for some cheap / free materials to practise with or use for a small project ... Find some local furniture makers and ask them if you could have any of their (fabric and/or leather) scraps / off-cuts. They may give them to you for free, or you may have to pay a small amount for them. Either way, you can get a large selection of material for nothing, or next-to-nothing. No, in fact it may be easier to embroider than pure silk. Personally I would do the embroidery then cut out the pieces of the cap pattern so if the edge frays you don't end up with not enough seam allowance to sew it together easily. (I speak from bitter experience here!) You can use something like 'Fray Check'* to stop it unravelling at the edge too, but its not invisible on all fabrics and can leave dark marks. Whatever it says on the bottle. (Learned that the hard way too - on my wedding dress, fortunately I had enough fabric to recut the piece in question). *That's the british name; basically it's a clear liquid that you paint on where you're going to cut and it acts like a sort of bond to stop the threads unravelling. When I was first taught the basics for embroidery, I was taught to split the 6-strand floss in to 3 strands and use that.